Kwara Concession borders the Moremi Game Reserve on the northern edge of the Okavango Delta. The Kwara Concession shares a 30km water boundary with Moremi Game Reserve but being a private concession offers night drives, boat and mokoro trips, walking and fishing that cannot be offered in the Game Reserve. The concession has both permanent water and seasonal flood plains ensuring the best of the Okavango Delta as well as extensive dry bush wilderness. Favored with labyrinths of permanent water channels and secret islands the concession offers you the privacy and tranquility available in the Okavango Delta. The year round waters at Kwara makes this one of the most consistent game viewing experience available in southern Africa with all the large exciting game species as well as all the interesting smaller species. Big game is plentiful and includes frequent sightings of giraffe, blue wildebeest, tsessebe, impala, zebra, buffalo, elephant, red lechwe, hippo and warthog. Dominant carnivores include lion and spotted hyaena with occasional leopard and wild dog. For bird enthusiasts, some 380 different species can be found. 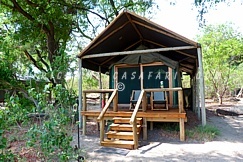 Kwara Camp is set overlooking a secluded lagoon in the northern Okavango Delta. This region offers a contrasting experience, as its location allows access to the permanent waterways of the Delta as well as expansive dry land areas, admired for their quality game viewing. Little Kwara Camp shares its name with Kwara but is a completely separate and intimate camp. 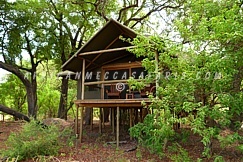 This is an small 5 rooms camp, accommodating no more than 10 guests, and is consistent to provide an intimate camp experience with personal service - a true vintage Africa.